New Delhi, India -- Will there ever be another Dalai Lama? Traditionally, the spiritual leadership of the Tibetan people passes from one Dalai Lama to his reincarnation. But the current Dalai Lama has raised questions about whether the institution should continue. He may, he says, be the last Dalai Lama. 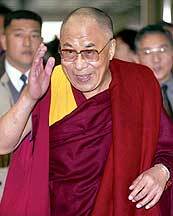 In 2001, the Dalai Lama declared that if the Tibetan people had an elected political leadership, then the institution of the Dalai Lama would no longer be relevant. He would be happy, he said, to live in semi-retirement, and let the institution die with him. Now, that position has been refined slightly. "If I was to die in the next few months or before we were able to return to Tibet," the Dalai Lama told the Hindustan Times, "there will be a new Dalai Lama." "But," he added, "if we cease to be a refugee community and can live in democratic Tibet, then I don't think there should be a successor to me after I die." In the event of the Dalai Lama passing on before Beijing yields on Tibetan autonomy, the new Dalai Lama will be chosen by searching for the reincarnation of the current incumbent. But the Dalai Lama admits to having doubts about the traditional approach to searching for a reincarnation of a dead Lama. He concedes that some 'reincarnations' have "not been true," and says that even in his own case, he is not the reincarnation of the last Dalai Lama. He thinks that he is a reincarnation of some spiritual leader, perhaps the fifth Dalai Lama, because when he was younger, he had vivid dreams about his past life. "Moreover," he says, "even though I was a very lazy boy, I always knew as much as my tutors on such subjects as Buddhist philosophy. That can only be explained if I had a past life memory." He concedes also that his predecessor as Dalai Lama had left detailed instructions about where to find his reincarnation, a search that led to the discovery of the current Dalai Lama. But, he argues, this doesn't mean that he is a reincarnation of the last Dalai Lama. "Perhaps my predecessor hired me to do the job," he laughs. In his view, Dalai Lamas are not always reincarnated in sequence so it is not necessary that the next Dalai Lama will be his own reincarnation. But does he know where the next Dalai Lama will be born, just as his predecessor knew about him? No, he says, he has no idea. But when the time comes for him to die and if he is still in Dharamsala, then he will know.